Facebook will be releasing a redesigned Facebook Pages that will feature tools similar to those used by Timeline, the profile layout change introduced by the social networking site last September. 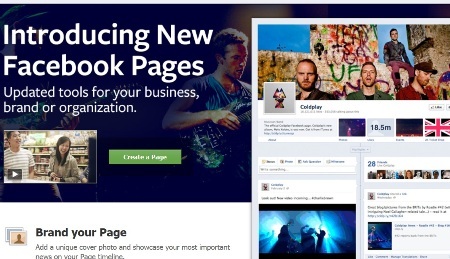 Facebook Pages is a feature aimed at businesses, organizations, celebrities and bands. It enables them to broadcast information in an official and public manner to people who chose to connect with them. Some of the features announced yesterday include a new cover photo and Page timeline. “The redesigned Pages lets businesses and organizations better express their identity and story,” a Facebook release said. New features like pinned posts will keep important stories at the top of a Page timeline for up to seven days. A new admin panel will also enable Page administrators to track their page performance and respond to private messages from people. Pages are now more personalized: when someone first visits a Page, they may see friends’ interactions with that Page spotlighted as friend activity, making each visit to a Page more relevant and individualized. People will also see how many of their friends are connected to a Page. The new Page design allows Page owners to size their photos bigger and post milestones that can include a date and other content. Page administrators have access to a log of their Page activity, including tools to easily highlight, hide or delete posts and change the date of a post. To lean more about the new Pages here. Download the product guide for new Pages here.